I’ve had my eye on this film for sometime primarily because I am wholly ignorant of African cinema and this seemed like the logical entry into the continent’s world of cinema. In fact, I’ve experienced very little of the undoubtedly rich world of African arts that I’m sure is simply waiting for me to delve into it. The only African novel I’ve read is “Things Fall Apart” by Chinua Acheba. Like that novel, this film make quite an impression on me and if it is indicative of the quality out there to explore, then it will be an area well worth the effort. 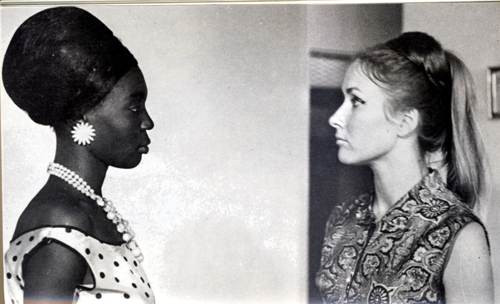 This film is credited as being the first sub-Saharan feature length African film. With that in mind, it may be surprising just how sophisticated the cinematic language in the film can be, implimenting a subjective perspective, metaphorical objects, and discontinuous editing that echo the revolutionary concepts from the French New Wave movement, with pangs of neo-realism and Godard-esque cinematic subversion. This relation to France is important as it not only relates to the stylistic choices as well as the language the film was written/filmed in, but also in that it is a Senegalese film. Senegal, as most of us are aware, is a Francophone country due to its colonialization by imperialist France. The relationship with France is what garners and drives both the plot and the subtext. A quick synopsis of the film is that a young African woman is hired by a French family to nanny their children while in Senegal. Eventually, the family moves back to France and ships her over to continue serving them. However, after arrival, the woman soon realizes that the relationship between her and the family has taken a tragic shift, shaped entirely by racist social norms. This downward spiral of depression and abuse is obvious in its damnation of imperialization and racism and it explores it in various ways. The French relationship is juxtaposed by intercutting with her past life in Senegal. The photography in the French apartment is cold and clinical, restrictive, emphasizing the emotional prison the protagonist is in by very much making the apartment feel very much like a real prison. In sharp contrast, the Senegal scenes are frequently filmed with long shots giving an expanse of the, while less developed, infinitely more free area. I recently watched Richard Pryor’s Live at the Sunset Strip and his story about his trip to the motherland and his realization that “there are no ******s” rang in my ears. In Senegal, she is a person. In France, she is sub-human. She is an object to be used, abused, and discarded. The most powerful images in the film are an African mask and the woman’s high heels. Watching her clean in high heels is an antithesis to most gender critiques, where they are often used either as a sign of sexuality or of the pain a woman puts herself through to appear more feminine. Here, it is used to represent a humanized sophistication of the woman that is being reduced to servant, even in such a modern era. The mask is more complex. It is regarded as the woman’s work which she gave willingly and it should be her’s to take back but instead is viewed as property by the French. It’s a tragic film and even at just a little over an hour, feels very complex. That said, despite the sophisticated formal aspects of the filming, it is still fairly rough when compared to its French or American contemporaries. I cannot tell if this is because there is missing footage from it or if it is simply rough editing. Despite this, the film has a beating heart and a lot to see. From a film history stand point and a purely cinematic standpoint, this is an important and quality watch. I want to end my critique on a note regarding the title. In English, it is officially called “Black Girl”. This title functions because she is an individual defined by her race. However, far more provocative and important is the original French language title “La Noire De…”. For those of you who do not speak French, this essentially translates to “The Black Girl Of…” implying her being owned by someone. This implication of being property is a defining aspect of the film and it’s a much richer and apt title.